Spotify, the music streaming service, has been the talk of Europe for a while now, but it wasn’t until a few months ago that it became available to U.S. users. With Pandora being a longtime favorite among Americans, Spotify had some serious competition right from the get-go. 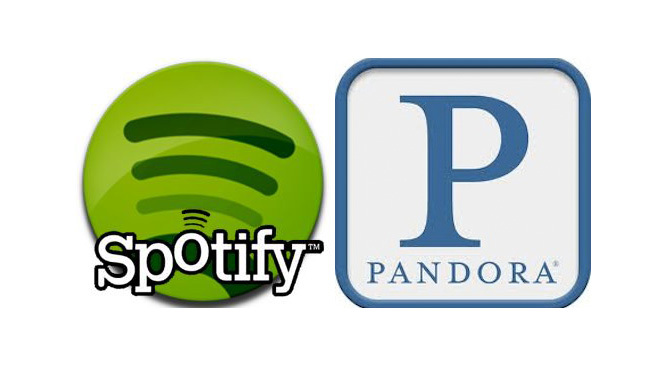 So how do the two music streaming services match up? Is one a better bet when it comes to having a sleek interface, the best music inventory, social integration and even free or paid features? We’ve put both apps to the test, and the results are in! This is like comparing apples to oranges, mostly because Spotify’s free service comes as a desktop app as standard, while the free version of Pandora is accessed online. While both also have mobile apps that are easy to navigate and pleasant on the eyes, it’s Spotify’s desktop interface that really stands out. With an appearance similar to iTunes, the Spotify desktop player is minimalist but displays an impressive amount of information. Pandora, on the other hand, is accessed via the web. In comparison to Spotify, Pandora’s free music streamer looks a little washed out color-wise and the interface can at times be confusing to navigate. Users can also easily alter the Spotify interface size, whereas minimizing Pandora requires resizing the browser in which it’s being viewed. Result: In terms of a sleek, easy-to-navigate interface, Spotify wins hands down. Most head-to-head category winners end up being based on subjective personal preferences. The music inventory category is a little more cut and dry though, since it’s based on the numbers that both music services self-report. Pandora’s FAQ states that it has a catalog of over 800,000 songs. Spotify, on the other hand, boasts 15 million unique tracks available to listen to! Result: The winner is clear. Spotify blows Pandora right out of the water when it comes to having a larger catalog of available music to stream. These days, sharing your favorite new music discoveries is almost as important as enjoying them on your own. To that end, you’re going to want to be able to let friends know when you’ve found a fantastic new band or song. Pandora lets users connect via Facebook so you can see what your friends are listening to. The connection feature only extends to your American friends however, since Pandora isn’t available across the pond. Spotify offers Facebook connect, as well as connection options through Twitter and Windows Live Messenger. In fact, Spotify not only lets users log in through their Facebook accounts, but also allows them to see and listen to any playlists their friends have created. If that weren’t enough, Spotify has an integrated inbox where you can connect with other users via their Spotify username. You can even send people tracks you own so they can listen to your favorite songs without having to search through Spotify’s catalog. Beyond this, Spotify has been available in Europe for almost three years now, meaning you can share with friends in the U.S. or overseas to your heart’s content. Result: Since Pandora’s service is pretty much a one-trick pony when it comes to social connections, Spotify’s myriad of social network options and unique inbox feature give it an easy win in this category. If you want to listen to music for free, you have to be willing to deal with ads. Unfortunately, both Pandora’s and Spotify’s ads are intrusive, annoying and repetitive. Expect an ad while listening to Pandora about once every three songs. Spotify’s more of a mixed bag, but I often noticed that the ads seemed to force-stop my music listening experience, requiring me to restart my playlist every 10 minutes. This was only an occasional occurrence but it was an irritating one nonetheless. In terms of free plan restrictions, Pandora also limits the amount of times you can skip music on a station before you’re required to actually listen to one all the way through. Spotify doesn’t do this, but it has its own variety of restrictions. For the first six months, users are limited to 20 hours of music streaming per month. After that, the limit drops to 10 hours per month and you won’t be able to listen to that favorite track of yours more than five times. Result: Both services have annoying ads and restrict your ability to listen to the music you want in some way. Pandora’s restrictions on skipping tracks are far less limiting than Spotify’s track replay and hour limits however, so it gets the win in this category. If having to listen to ads in between songs is too much of an irritation, both Pandora and Spotify offer paid options that let you avoid ads and access additional music streaming perks. Pandora’s paid version is called Pandora One. It gives users the option to install a convenient desktop app, has unlimited licensing, better audio quality and the ability to skip tracks more often than in the free version, all for either $6 per month or $36 per year. Spotify actually has two paid options: an unlimited plan for $4.99 per month and a premium plan for $9.99 per month. The unlimited plan eliminates audio and visual ads, as well as gives you completely unrestricted access to music on the desktop app. The premium plan gives you access to Spotify’s music catalog on a mobile device or tablet, in addition to the features offered in the unlimited plan. Another huge perk of the premium plans is that you can also listen to your playlist music while you’re offline. Plus you get access to exclusive content like album launches immediately. Result: This is a tough category to judge, considering the paid features for both services vary so drastically. With Pandora’s paid service, you get a desktop app that already comes free with Spotify’s unpaid version, for example. But you can’t access Spotify’s mobile app without a premium plan, whereas Pandora’s mobile app is available to unpaid users (with ads). In terms of cost though, you really can’t beat Pandora’s $36 a year. Spotify’s plans both cost substantially more. Unless you’re specifically planning to use the features that come along with those plans, Pandora’s a better deal financially. In the end, it truly depends on how you plan to use your music streaming service to determine whether Spotify or Pandora comes out on top. If you’re on a budget but want to eliminate ads and discover new music, Pandora’s the clear winner. If money isn’t as much of a concern or if you’re more interested in connecting with friends to discover new music and create personalized playlists, Spotify is the hands down winner. In terms of usability and number of features offered, Spotify’s also got a leg up. Spotify is unparalleled, making it a winner for track searching, exclusive content and music sharing and discovery among friends, but for some features, you need to be willing to pay the price.